Ideal as temporary road signs, parking signs and event signage, Variable Message Signs can be put to great use at everything from road works sites to festivals. 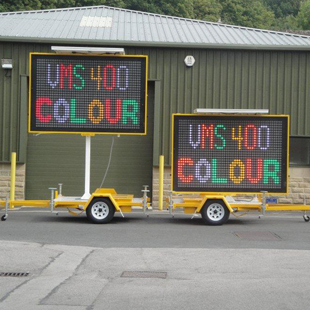 Easy to use and environmentally friendly due to being powered by solar panels, the full colour VMS features clear, bright, 4 colour full matrix displays. Being illuminated signage it is highly visible, even at night or in bad conditions. Amber Langis Ltd are industry leaders in Variable Message Signs. Our colour signs are also available with a vehicle activated display - please see our section on VAS for more information. For additional technical specifications or to find our more, please contact us or download our comprehensive data sheet on full colour VMS.